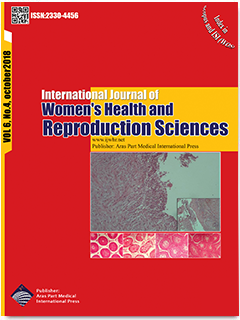 Objectives: The purpose of this study was to compare the effects of letrozole plus recombinant follicle stimulating hormone (R-FSH) and human menopausal gonadotropin (HMG) on ovarian stimulation in intrauterine insemination (IUI) cycle. Materials and Methods: This randomized clinical trial was conducted on 130 women with polycystic ovary syndrome (PCOS) resistant to clomiphene and letrozole who were divided into A and B groups. Both groups received 5 mg of letrozole daily from the third to seventh day of the cycle and then group A (n = 59) received 75 units of HMG intramuscularly per day and group B received 75 units of R-FSH subcutaneously per day. Follicular maturation was triggered with 250 μg of recombinant human chorionic gonadotrophin (R-hCG) and IUI was performed 36 hours later. Main results under study were the number of matured follicles, endometrial thickness on the day of hCG injection, and the rate of chemical and clinical pregnancy. Results: The 2 groups were not significantly different in demographic information. The rate of pregnancy was significantly higher in the letrozole + R-FSH group than in the letrozole+HMG group (20% and 5.8% respectively, P = 0.04). There was no significant difference between the 2 groups in the number of mature follicles (≤18 mm) and endometrial thickness at the time of hCG injection (P > 0.05). Conclusions: Letrozole plus R-FSH is a recommended regimen for ovarian stimulation in PCOS patients.